I know we have Rob's Postal going on but I thought maybe we could do something on a monthly basis. What do you all think? We can keep it simple without any mailing or fees, etc. (no prizes either, just braggin rights) All that would needed is the desire to shoot and post a picture of your target. I can put a target together and we could start for the month of April. I think postal shoots are a great way keeping yourself in shape shooting. I like postal shoots. We used to have monthly front stuffer matches at our range back in the 50's to mid 70's but the competition thinned out from shooters going under. Not many M/L shooters shooting at our range anymore. We had poker shoots, splitting balls on a ax head, cutting strings and over a log driving spikes through 2X6, It was great fun. We shot a lot of targets like in the photo I use for a practice target putting a ball close to the bottom of the V with out cutting a line on all 4 sides. It was pretty windy when I shot this target so I leaned on a post. Dang, Kurt...that's good shooting at 50! I can't see well enough to even try that! doc I wish I could do that all the time. Maybe I just missed good. I shot that test target leaning on a post because the winds were pushing the long barrel pretty good. I was filing the front sight down when I first shot this rifle and testing some teflon patches and the juice that came with them a friend gave me. 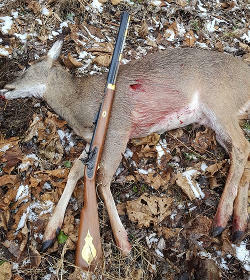 This Southern Mountain working mans rifle is a exceptional fine shooter. That X has some heavy lines about a 1/4" wide.